Who's got an appetite for something different at somewhere different? Welcome to what's new in Tampa's eating and drinking establishments. 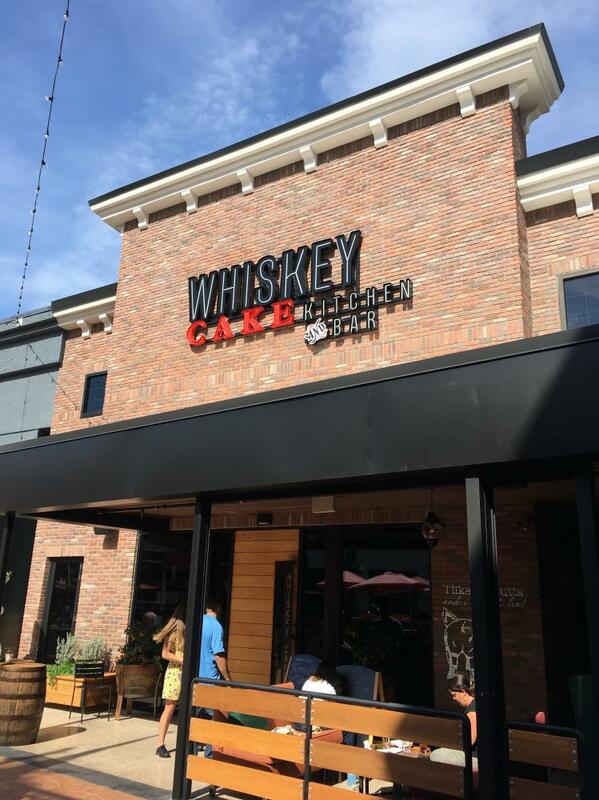 The already-diverse dining scene at International Plaza has welcomed Whiskey Cake Kitchen & Bar to Bay Street and its restaurant ranks. Meanwhile, Downtown Tampa is experiencing vibrant restaurant growth of its own that includes recent openings of Harpoon Harry’s Crab House, Mole Y Abuela, Oak & Ola, and M.Bird. Some of these newcomers are existing brands that have expanded here. Others have celebrity chefs at their helm who selected to launch a new concept locally. And all are worthy of a visit to find out firsthand what each is bringing to the table in terms of flair, international flavors, creative cocktails, and inventive eats. Patrons of the site formerly occupied by Fly Bar loved its rooftop bar, high-end cocktails, and well-crafted cuisine. Now under new ownership, boasting a new name, and featuring a new cuisine, fans of what was will likely become just as ardent fans of what it’s become. Today, Mole Y Abuela occupies the tasteful brick building that has been a mainstay of the North Franklin Historic District for decades. The visionary behind the new concept is Fabio Viviani who first came to national prominence when he competed in Bravo’s Top Chef cooking competition. He didn't win the title, but he won the hearts of viewers and was voted fan favorite. Viviani has been lending his time and talents to a number of restaurants across the country from California to Chicago. He needs no introduction to Tampa having helped to launch Osteria, also located in Downtown Tampa just blocks away from Mole Y Abuela. Small plates, or tapas, as well as larger servings feature Spanish flavors accented by Mediterranean and Mexican influences. Diners may creatively mix, share, and sample such delicacies as Bacon-Wrapped Dates, Lamb & Pork Meatballs, Duck Legs “Carnitas,” and Pulpo a La Gallega, braised Spanish octopus. 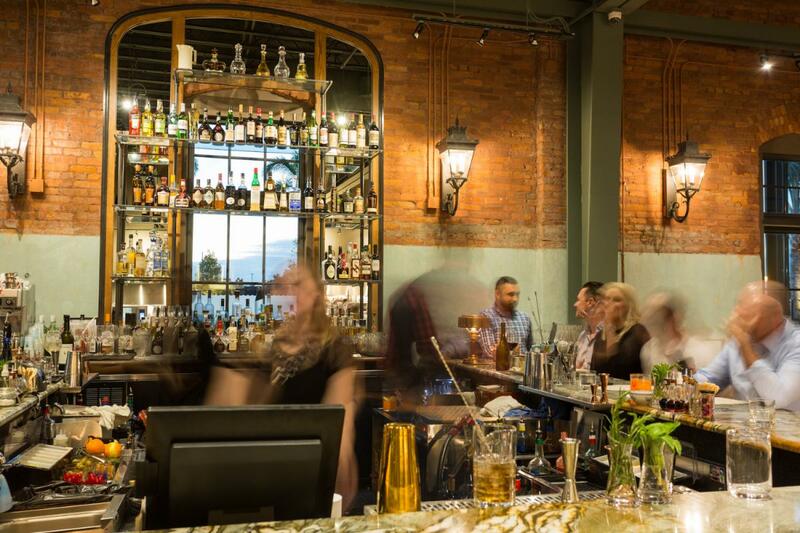 Anchoring a coveted corner spot of the western side of Armature Works, guests can relax in a swanky indoor or outdoor setting while enjoying full service and exploring a menu that's as exciting as it is enticing. 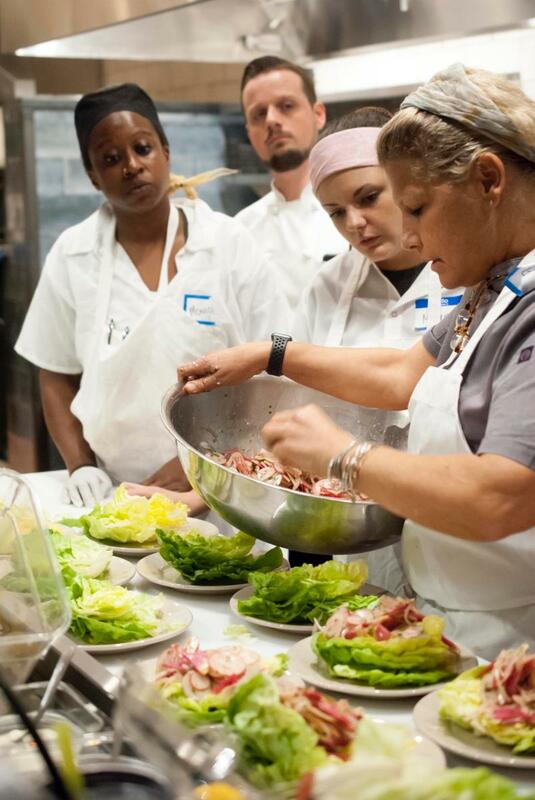 Chef Anne Kearney earned her cooking credentials at the Greater Cincinnati Culinary Arts Academy then ventured to New Orleans to work with noted Chef John Neal at the Maison de Ville Hotel’s Bistro. They continued to work together when he opened Peristyle and hired her as his sous chef where she further honed her classic French cooking techniques. The next three years were spent working alongside Chef Emeril Lagasse, initially in his restaurant kitchen and later researching and fine-tuning recipes for Essence of Emeril. She returned to her restaurant roots in 1995 after purchasing Peristyle following the death of Chef Neal. By 2002, she earned the “Best Chef Southeast” award from the James Beard Foundation. Kearney headed back to her Ohio hometown of Dayton in 2004 where she established an all-natural garden on her family’s farm with the intention of supplying her next restaurant with fresh produce. Rue Domaine opened its doors in 2007 and was acclaimed for its Americanized take on classic French Provencal fare. Fast forward to 2018 when Chef Kearney finds herself in “a group of close friends that came together through our love of food, beverage, and community.” That culinary collective includes John and Trudy Cooper and Chris Arreola, partners with Chef Chris Ponte’s On Swann in Hyde Park Village, along with Andy Ganger, whose background includes serving as a longtime managing partner with Bonefish Grill. to connect the dots even more completely- Trudy is a former co-founder of Outback Steakhouse, and John is a former president of Bonefish Grill. Rounding out the Tampa restaurant roots running deep through this venture is Sous Chef Brian Cook, whose career started at Saddlebrook Resort in Wesley Chapel prior to working at the Sidebern’s (which was later rebranded and reopened as Haven ), an acclaimed restaurant affiliated with Bern's Steak House. Talk about a prime perch! Located above Oak & Ola, M. Bird is the latest, and possibly loveliest, rooftop spot to open in Tampa. With its sweeping views of the Hillsborough River, downtown skyline, and Tampa Heights neighborhood, not only is this the debut of a new view, it's also a splashy place to soak it all in. The combination bar, lounge, and dining spot caters to crowds 21 and older and requires reservations for groups of six or more. Its claims to fame include a menu of “tropically-driven” craft cocktails made from "a robust selection of rums and other sugarcane-based spirits" plus sharable small plates and specialties such as Jerk Chicken Egg Rolls and a bite-sized version of a classic Puerto Rican dish, Mofongo. "M.Bird's origin comes from the Florida State Bird, the mockingbird,":said Taryn Bruck, co-owner and operator of Armature Works. "With live greenery and pops of color, guests will feel as if they're stepping into another city... it will be a completely different and unique experience." There's seating under cover, open air, and a lovely bar to enjoy all of the fresh flavors and fine pours served here. Remembering the name may be a bit of a challenge for some, but the first impression that this new-to-Tampa restaurant makes on guests is pretty unforgettable. Located on bustling Bay Street at International Plaza, this marks the seventh site, and first in Florida, for the dining spot that's more widespread and well-known in Texas and Oklahoma. The space is deep, and the ceiling is high, making it feel expansive, open, and spacious, which it as at nearly 8,000 square-feet. One plus is that the noise level is lively but doesn’t become overwhelming and off-putting possibly due to all of the noise-absorbing space. There are tabletops for individuals and couples, communal seating areas, and even wingback chairs that can make for a fine place to settle for a sip, a bite, and a chat. The patio and bar can accommodate 40, the entire restaurant has room for just over 200, and there's a private dining room for dozens more. Dimly-lit, the feeling is comparable to a private club or members-only lounge but with a more welcoming air. 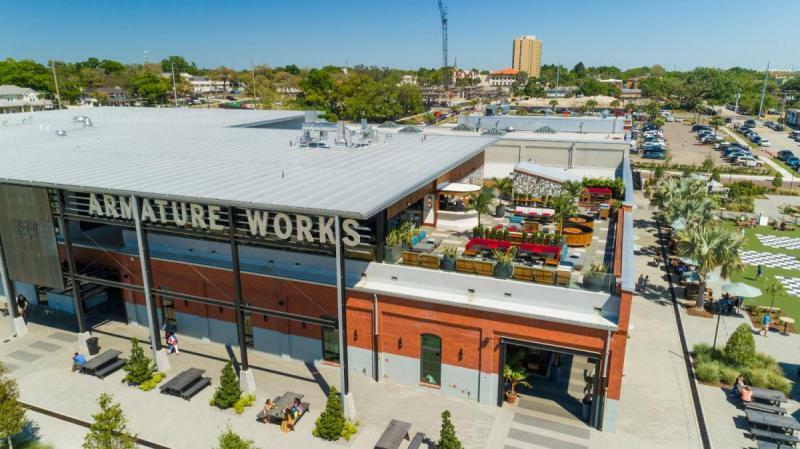 It’s a nice, novel addition to the variety of places to eat and drink at this shopping venue that range from fast casual to fine dining. The niche they want you to note is that they follow farm-to-fork and garden-to-glass philosophies. An on-site herb garden contributes to that "fresh is best" factor. Local vendors populate their list of providers and, just to make sure nothing ages out and goes past its prime, there are no freezers or microwaves. Nothing in this kitchen but hands-on chefs turning out made-from-scratch food. Of course, with whiskey in the name, you know that has to be a big part of their fame and their game. 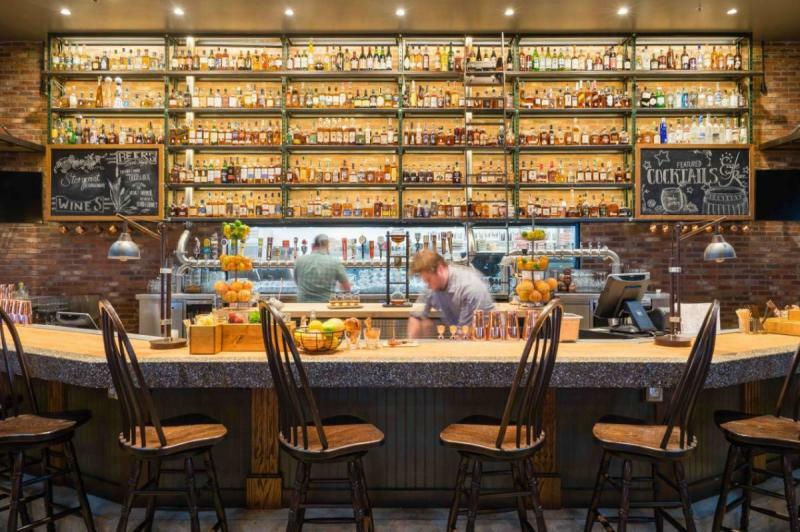 Cocktails are created using farm-fresh ingredients, hand-press juices, and a selection of 350 whiskey brands as well as micro-brewed beers and wines on tap. If pirates had BFFs back in the day, then Tampa’s legendary swashbuckler Jose Gaspar and the no-less-legendary Harpoon Harry would likely have been close comrades. So it's fitting these two pirating personalities now share common ground here in the Tampa Bay area. The opening of the latest location of Harpoon Harry’s Crab House coincided with this year’s Gasparilla pirate invasion and parade festivities, adding yet another venue for eating, drinking, and debauchery in Tampa’s downtown. The sprawling, two-story restaurant boasts a large first-floor bar, ground-level main dining room, and adjoining dining area overlooking the sushi bar and its inviting seats. The second floor has a smaller bar but also offers indoor dining, private dining space, and outdoor balcony seating that offers guests a lovely view of the downtown surroundings. The restaurant filled a longtime empty corner space opposite that Tampa Convention Center that now breathes some much-needed liveliness into a part of downtown that was more suited for passing through than stopping by. The menu is not overwhelmingly extensive but provides a satisfying selection of dishes featuring seafood, beef, chicken, pork, and duck. Appetizers, salads, soups, lunchtime sandwiches, and entrees offer a range of flavors that are reasonably priced. Don’t let the wealth of tables and chairs fool you. Prior to hockey games, concerts. and special events at the Amalie Arena, this place can get packed, and the crowd can be a bit loud, so make reservations or plan visits during a less mainstream time, but be ready to have a great time regardless of when you go. Harpoon Harry wouldn't have it any other way!